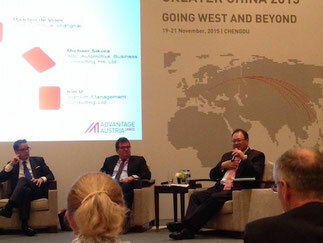 AUSTRIA CONNECT Greater China is the most important event of the Austrian business community in China. This year it was held from 19 to 21 November in Chengdu under the motto “Going West and Beyond”. Chengdu is the capital of Sichuan and one of China’s most rapidly growing provinces. The region has recently experienced a rapid increase in foreign investment. Sichuan’s success demonstrates how important it is to pay attention to the potential of markets outside China’s well developed coastal regions. The exchange with executives of Austrian businesses in China is at the core of the AUSTRIA CONNECT event. Panel discussions and expert presentations focused on the topic of expanding in China and beyond and explored related business opportunities and challenges. Two of our executive search consultants from our offices in Shanghai and Beijing joined the event in Chengdu to network with the Austrian business community in China.